IBM i Integration Use Cases - Infoview Systems, Inc.
Meet Infoview and Mulesoft crew in person and further discuss my use cases Join us at Mulesoft Summit Chicago and COMMON Fall Conference in Columbus , there will be a great lineup of speakers and of course awesome food and after-glow reception! Below is a high level overview of each pattern. I will further discuss the use case details and examples in the follow up posts. The majority of IBM i applications use integrated DB2 database as data store. 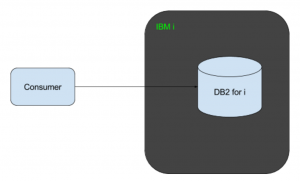 IBM DB2 is a mature and robust relational database with standard JDBC and ODBC connectivity. When faced with requirement to access IBM i application data from external clients, the first thing that comes to mind is to just connect to the IBM i from the source system directly. Similar approach can be used for executing IBM i business logic. The client system directly calls IBM i programs or executes a DB2 stored procedure that wraps the IBM i program. Java: IBM i Toolbox for Java (JTOpen, JT400) is a Java library that includes JDBC driver as well as tools for working with various IBM i objects, such as programs, service programs, command calls, system values, IFS, etc. .Net: IBM i Access for Windows ODBC driver for .Net clients – CWBX.dll and IBM i Data Provider enable DB2 access and allows working with various IBM i objects (calling programs, checking output queues etc). PHP: PHP Toolkit for IBM i provides DB access and ability to call programs, work with queues etc. Not recommended, except in limited cases when current and projected number of interfaces with IBM i is small, IT has full control over consumer application that accesses IBM i database. The biggest problem with clients accessing application DB or calling programs directly is the client code is now tightly coupled to IBM i data model. In many cases, each client must also implement application specific business rules for extracting and formatting the data. Even with just a few client applications, it becomes painful to evolve the IBM i application and DB model or dependent clients. After some time it gets to the point where even a small change in one system takes months of coordination across multiple dev teams. The solution is to provide the access to data and business logic via reusable APIs. 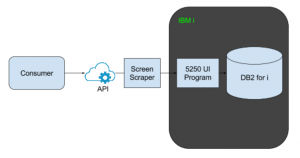 Instead of accessing the IBM i database or calling a program directly, consumer application calls an API that executes the IBM i Data Access program and / or accesses the IBM i database. This approach insulates the clients from internal IBM i application changes as long as it doesn’t affect the request / response structure. There’s a number of technical approaches for executing IBM i program remotely. The important factor to consider is where the request / response transformation happens. I found the most efficient approach is to have RPG programs deal with IBM i database operations and program calls, and use robust mapping and prototyping tools, such as Mulesoft Dataweave, for XML / JSON / flat file / … translations. The above two use cases covered common integration scenarios of providing easy access to IBM i application data, or executing business logic. 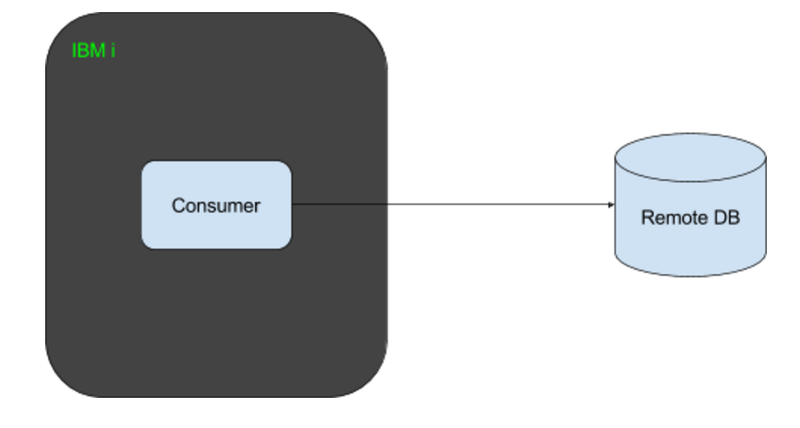 Data access works great when the data model is well designed and aligns with business domain language. It’s also pretty straightforward to produce IBM i API when the business logic is externalized as (or can be easily extracted into) callable programs. 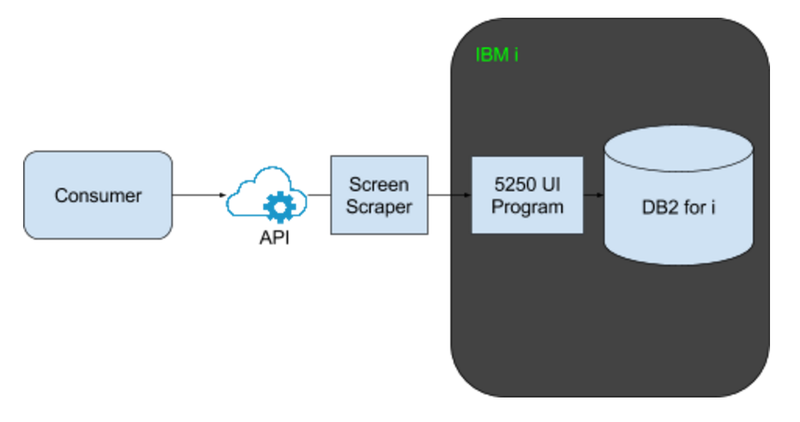 For scenarios where the application source code is not available or the complex business logic is embedded into UI programs and cannot be easily extracted, the common integration approach is to use a “Screen Scraper” tool that taps into IBM i user interface stream (5250 protocol), sends the request data via simulated user keystrokes and retrieves the response by reading green screen data. The end result is an API wrapper with IBM i UI program working in the background as if user performed all the data entry. Another flavor of the same approach is using RPG Open Access handlers for scenarios where UI source code is available for modification. The screen scraping has a generally bad stigma, unless, of course, you work for one of a number of vendors in this space. The typical use of such tools is to modernize the green screen UI with minimal effort, and the main consideration points are low quality of auto-generated UI, tight coupling to underlying IBM i application, limited reuse, duplication of effort and impact on CI / CD. Of course the real life is far from being black and white, and there are use cases where screen scraping technology can bring some value. 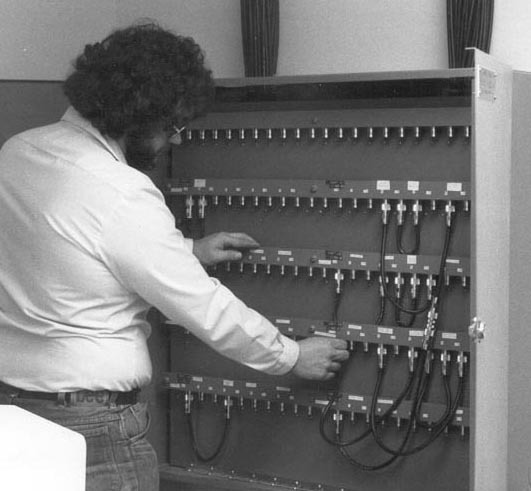 Anyway, modernizing IBM i UI is a whole separate topic for another time and another post. In the context of system integrations, however, in a short or medium term the approach can be pretty efficient for externalizing business processes, especially when the source code is not available, or the business logic is very complex and spread across multiple UI programs, which makes it difficult and risky to externalize. As mentioned above, the below limited list includes the tools our team used or evaluated. There’s a number of other vendors in UI modernization space and I would think most can to a certain degree address the 5250 to API transformation. 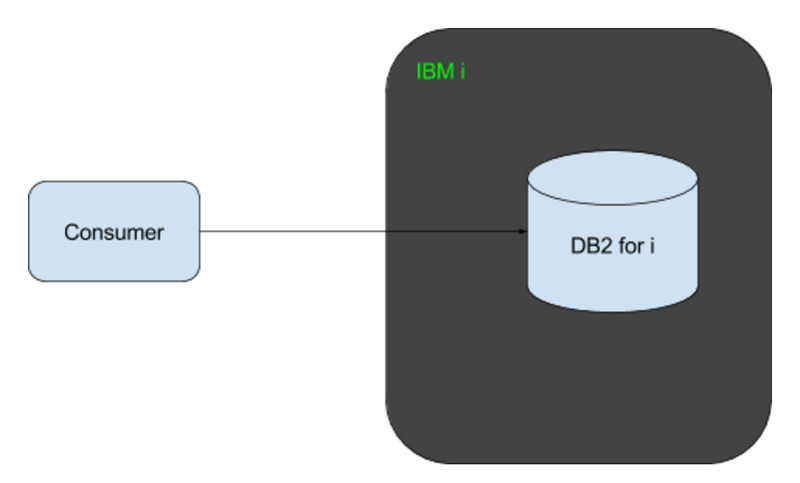 In this scenario, a process running on IBM i, directly accesses remote DB. I have seen this approach used extensively in the environments where application database is partitioned into multiple IBM i systems and there’s a need for real time data federation. Another common use case for a direct interface with external systems is where IBM i developers have strong Java skillset and need to just “get things done” without relying on overburdened SOA team. 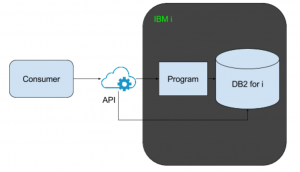 Most typical approach is to use Java / JDBC to connect IBM i process to remote database. There are several strategies and considerations for JVM and class loading, performance, security and monitoring. When working on IBM i transformational initiatives, there’s a lot of talk about unlocking IBM i data and processes. 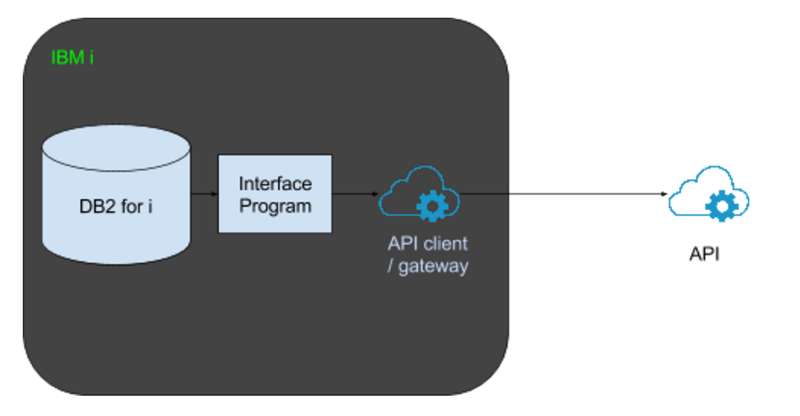 The IBM i provides APIs for easy consumption by other systems, either directly or via integration fabric such as Mulesoft Anypoint. This focus is typical for large but relatively self-contained, stable and slow changing IBM i systems that are being plugged into growing application network. In contrast, many evolving IBM i applications have smaller scope and often need to consume external data sources or business logic exposed via APIs. As with other integration patterns, there’s a number of technical approaches, tools and tips. The key considerations are ease of use, scalability, governance and operational insight. The separation of duties between the traditional IBM i and integration specific languages directly impacts the speed of development and ongoing refactoring. It’s possible to build and parse XML and JSON in RPG, and there are several frameworks and tools that support templates etc, but it requires specific skills and often slows down integration initiatives. My strong preference is to let RPG handle the business transformations while dealing with database tables and program calls, and implement all data transformations, security etc with the help of mapping tools such as Mulesoft Dataweave. Makes a huge difference in the speed and quality of integration development. Some applications, such as Billing and A/R, are batch-oriented and deal with a large data volumes. When such process needs to access external data or logic or share the results of the batch run, calling an API for each record often can slow down the process to hours or even days. Instead, such balk processes can be implemented via good old file transfer or bulk ETL. Back in 90s and early 2000s we built quite a few such integrations based on FTP scripts, and many of these interfaces, for better or worse, are still in use. 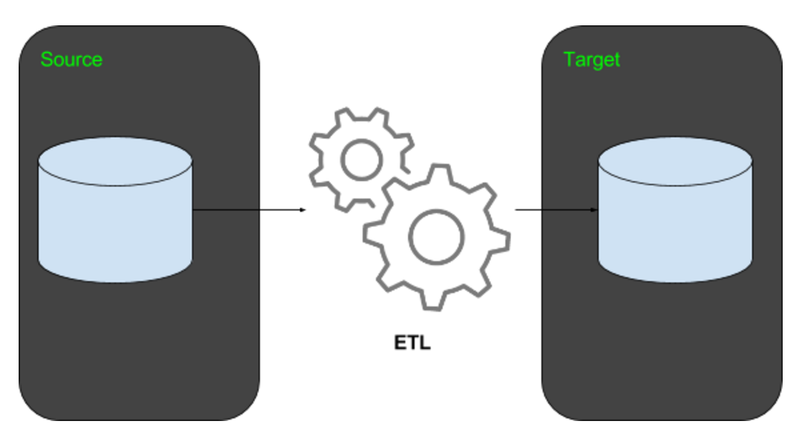 The specialized ETL tools streamline application mapping and transformation rules, address encryption of data in flight, and in some cases greatly improve the performance by splitting the processing into chunks then processing them in parallel threads. IBM i is a modern platform that offers a number of built-in integration options. Since it’s introduction back in 80s the platform attracted a large ecosystem of vendors, further expanding integration choices. Selecting the right tool and approach often reminds me of wandering through the outdoors equipment store. There’s lot of hype and overwhelming number of vendors trying to differentiate their products. I like REI because their sales folks get to use their gear and can explain different options based on their experience, and don’t hesitate to suggest to stick to good old battle-tested stuff that still works. Hope this post provides useful information navigating the multitude of IBM i integration choices. Feel free to contact me if you have any questions, comments, or suggestions.